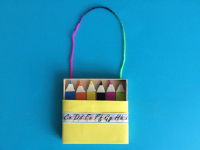 Explore colors with this adorable craft. Gather your material. 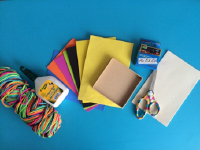 You will need multicoloured yarn, white glue and/or hot glue, different colors of Fun Foam, beige Fun Foam, a lid from a small cardboard box, scissors, and decorative ribbon (optional). 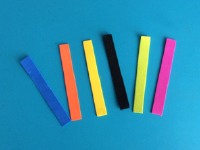 Cut a strip out of each color of Fun Foam (except beige). Adjust the length of the strips per the size of the cardboard lid. 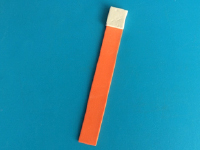 Cut small squares out of the beige Fun Foam and glue one square on one end of each strip of colourful Fun Foam, making sure not to apply glue near the very top of the square (see step 5). 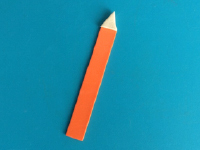 For each crayon, cut the beige square as shown to make it look like the tip of a crayon. 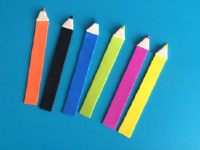 For each crayon, gently raise the tip of the triangle and snip a tiny piece off with scissors to reveal the color. 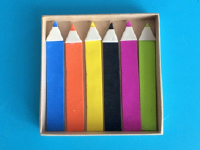 Glue the crayons inside the box as shown, cutting a section off the bottom of each one if necessary. Wrap the box with yellow Fun Foam (or another color) two thirds of the way up so the crayons are visible. Stick the decorative ribbon on the bottom portion of the box. 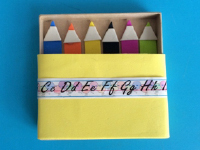 Glue both ends of a piece of yarn behind the box so you can hang you box of new crayons within your daycare to add a touch of color to your décor.